What a super human effort! That will be the first reaction of any normal film buff who watches Kamal Haasan's [Images] Tamil magnum opus, Dasavathaaram [Images]. The film is certain to thrill and entertain the audience for all of its 165 minutes, making them feel that they are watching something unusual and spectacular on screen. The film starts off with an incident that occurs in the 12th century when Shaivite intolerance against Vaishnavites was at its peak. An ardent Vishnu devotee loses his life to save the idol of Lord Ranganatha. Kamal plays his first role of Vishnu devotee Rangarajan in this episode which is marked by excellent technical work and the actor's extraordinary performance. From here, the film goes to a time when the whole world is on the brink of a biological warfare waged by terrorists. Actively opposing them is the American president who urges the rest of the world to combat this evil. Meanwhile, a computer chip containing a vicious biological material goes missing from a laboratory in the United States. An in-house scientist Govinda [Images] (again played by Kamal Haasan) who is aware of the dangers of the material launches a hunt for the missing material, which takes him to India. In the course of the hunt for the missing chip, Kamal takes on eight more characters and travels to many continents. The film is a scientific thriller par excellence and it is certain that Kamal has excelled in his eleventh role of the story and script writer. It is difficult to imagine that any normal script writer can think of weaving such a fantastic subject that mixes intelligence with commercial ingredients. It requires an extraordinary intelligent mind to write the sequences some of which are food for thought to the intellectuals as well as ordinary people. Perhaps this is the best script of Kamal Haasan till date. Throughout the film, the writer, an atheist questions the existence of God. Now comes the challenging part -- picking Kamal's best role out of his ten. Will it be Annachi or Padikkadha Medhai, who fights against the Sand Mafia? Or will it be the investigative officer Naidu? Better yet, will it be the 100-year old woman Krishnaveni, who still yearns the return of her son? But what about the Punjabi pop singer Avatar Singh or for that matter the former CIA agent, Fletcher? Will it be President George Bush [Images] or the lanky Afghan merchant? You get the point. So excellent is the make-up and voice modulation that picking any one character is difficult. 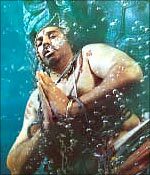 Though Kamal had performed many roles that were similar to the roles of 12th century priest, Rangarajan and scientist Govinda, you still see some novelty in Dasavathaaram. It is very difficult to single out the best sequence of the film, yet the tsunami episode is perhaps the outstanding presentation mainly because of the top class visuals backed by a superb background effort. It is not necessary to say how great an actor Kamal Haasan is but one thing has to be said; no other actor would have dared to take on these varied roles. And hats off to him. As for the heroine, Asin, she has improved since her debut. In a way, Dasavathaaram is an extension of her excellent performance in Ghajini. All the other artists have also performed very well. K S Ravi Kumar should also be complimented for his handling of such a complicated but challenging subject. This may well go down in the history of Indian cinema as a unique experiment in the commercial circuit. He has taken the best out of his artists and technicians. Only Himesh Reshammiya [Images] fails him. Except for Ulaganayagane and the Bhangra song, the rest are nothing to write home about. However, background music by Devi Sriprasad is excellent. So is the camera work by Ravi Varman. The special effects and stunt choreography are of international standards. All in all, Dasavathaaram as an extraordinary effort.